Team Suzuki Press Office – August 1. 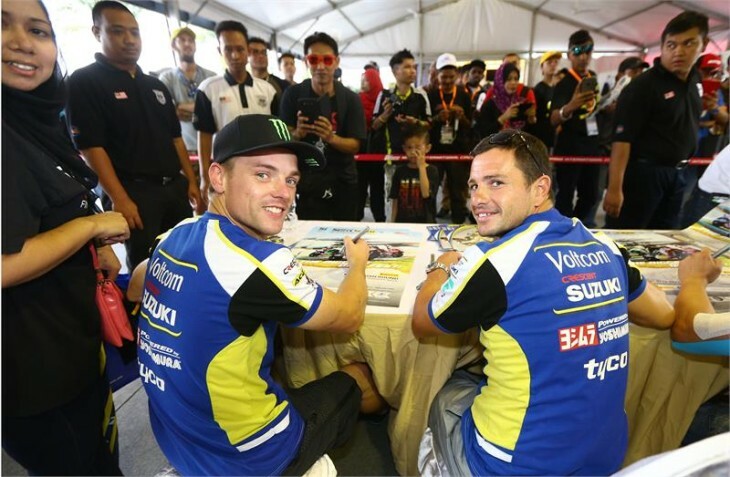 Voltcom Crescent Suzuki’s Alex Lowes rode a thrilling World Superbike Superpole contest to take fifth place at the Sepang International Circuit in Malaysia this afternoon. A challenging morning had left Lowes out of the top-10, with a turn four crash in the third free practice, but as the asphalt temperatures rose to almost 50°C for Superpole 1, the British racer set out determined to advance with his Yoshimura-powered GSX-R. His early appearance on the qualifier comfortably saw him into the second session with a 2’04.4 – six-tenths clear of the next rider – while his SP2 performance improved his lap-time to 2’04.018, lining him up on the second row of the grid – just behind Aprilia’s returning double World Champion Max Biaggi – for tomorrow’s races. An exceptional start to Saturday saw Randy de Puniet secure his first direct qualification into Superpole 2 aboard his Suzuki GSX-R1000, setting a 2’04.8 lap on race tyres to take fourth in the final timed free practice, the dry but cool (for Malaysian standards) 28°C having only warmed the track to a manageable 33°C for the opening 45-minutes. Struggling for tyre grip as the temperatures soared, the Frenchman was unable to match his earlier time on the qualifying rubber but continues his improvement with a season’s best, claiming 11th and a fourth-row start with his 2’05.100 lap. With the expected rains failing to materialise, Kawasaki’s Tom Sykes reaffirmed his Superpole dominance with a 2’03.240. However, the threat remains in the air promising to provide further drama as Voltcom Crescent Suzuki return to the Sepang track for tomorrow’s two 16-lap races, scheduled to start at 13:30 and 16:30hrs local time (06:30 and 09:30BST). “Another very strong qualifying performance by Alex today, missing out on the front row by less than 0.2. We struggled a lot in FP3 to achieve the right balance in the bike and in terms of improving performance got nothing done in that session, so that set us back a little bit, but the team, and Alex himself, recovered very nicely. “On Randy’s side, following on from Laguna, it has been a consistently strong performance this weekend, particularly in FP3 when Randy achieved a high 2’04 on race tyres and put himself into fourth position overall before Superpole. He rode well in Superpole but unfortunately couldn’t replicate the earlier form but hopefully with some help from his team can find some small improvements for tomorrow. Sepang – eni FIM Superbike World Championship – Superpole: 1. Tom Sykes (Kawasaki) 2’03.240: 2. Jordi Torres (Aprilia) +0.270: 3. Sylvain Guintoli (Honda) +0.596: 4. Max Biaggi (Aprilia) +0.708: 5. Alex Lowes (Voltcom Crescent Suzuki) +0.778. 11. Randy de Puniet (Voltcom Crescent Suzuki) +1.860.